These beautiful and very special hand carved Teak Chopping Boards have been crafted in East Java, Indonesia from carefully managed teak reserves. Teak or Tectona grandis is native to mainly Indonesia, India, Malaysia, Thailand and Burma. Teak wood contains an oil that helps the wood to be water resistant, this same oil content protects the Teak from decay, insects and bacteria. Java teak is considered by experts to be the best in the world. 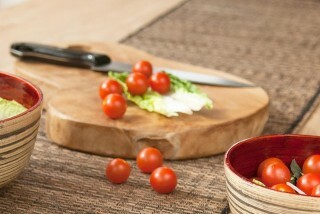 Treated with just a little care a Java Teak Wood chopping board can last a lifetime. Imported by Ancient Wisdom, you can be sure that this product has been produced and traded ethically and with careful regard to the world resources.